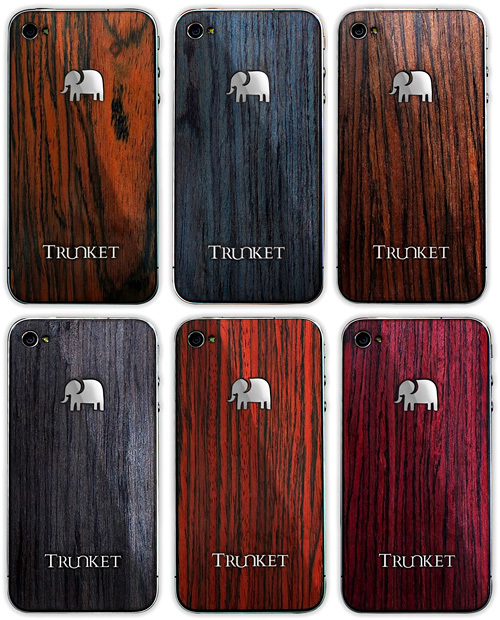 Trunket Hand-Crafted Wooden iPhone 4 Skins | OhGizmo! If turning your iPhone 4 into an homage of a retro gadget (like a Speak & Spell or Sony Walkman) isn’t your thing, but you’d still like to dress it up so it stands out from the millions of others out there, it turns out a natural wood finish doesn’t look half bad. Before I saw these skins from Trunket I would have thought a wooden iPhone would look really tacky, but these hand-crafted skins have changed my opinion. Made from American Rosewood treated with various washes and finishes, these colorful wooden skins stick to your iPhone like any other decal and are just as easily removable. But instead of vinyl, they’re made from actual bona-fide wood. Now I can’t say I’m too thrilled about the Trunket logo and elephant graphic on the back, but if they appeal to you they’re available directly from Trunket for $24 each. Nice designs and would definitely look good for the iphone. Knowing it is made of wood, I wonder how much weight was added to the overall weight f the phone. Would be nice if they didn't put their stupid logo all over the thing.